Melissa MacTavish has been designing beautiful showhomes and helping new Kensington homeowners create their own personalized spaces for over five years. So when it came time for her to embark on her own build, picking out the perfect home for her and her schnoodle pup, Charlie, she had some significant industry know-how to make the experience easier. “Word-of-mouth and reputation go a long way in this industry,” says Melissa. “(Kensington) takes pride in building a good home and they want their clients to be happy, which is not really true of all builders out there. Once you’ve chosen a builder you trust, check out their repertoire. 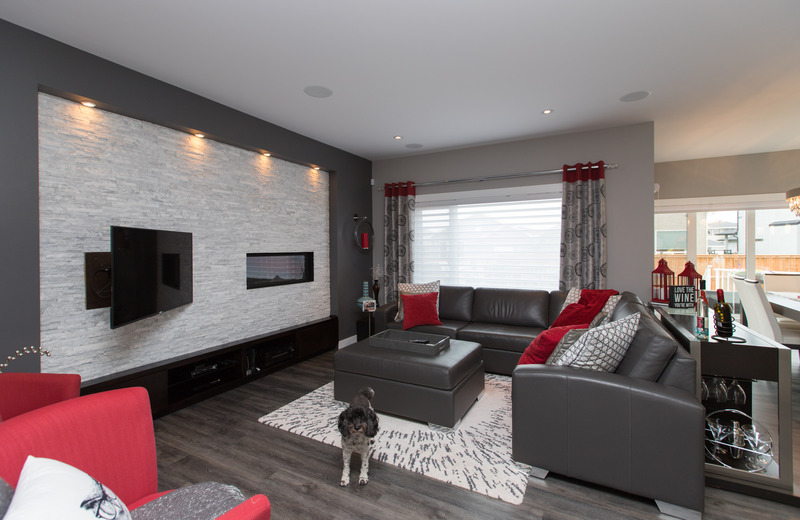 “I’d suggest starting by going through the showhomes – having a good idea of what they’ve built and how they’re built. Though not everyone has the regular exposure Melissa does – showhomes are open to the public in nearly every top-selling floorplan variety, showcasing a wide range of finishes, to help you determine your needs and a best fit for you. Designing a home from top-to-bottom can be daunting – but luckily, Kensington has high-end finishes included as a standard with its homes, so many of the usual upgrades are already accounted for. But because there are still a lot of colour selections to make and finishes to choose from, it’s better to start with one room, and work forward from there. “I knew I wanted a white kitchen so that’s a major starting point,” says Melissa. “If you’re not working in the industry, you don’t see this stuff every day. I always find it’s helpful to go around to the showhomes and find out what you like. Most likely your sales agent is going to communicate with the builder on your behalf, so make sure you’re comfortable asking them questions and you’re happy with the speed of responses. “That’s really the most important part is having that relationship,” says Melissa. If you find the whole thing just a little too much, there is the option of buying a move-in-ready or spec home, so there are less decisions to make, but you’re still getting a brand-new, quality-built home. To see what’s available at various stages of construction, visit our quick possession page here.